Hanok, or traditional Korean buildings, being turned into hip cafes and restaurants are no longer newsworthy, as the touristy areas of Bukchon, Seochon and Samcheong-dong are dotted with these amalgamations of old and new. What is unique about a hanok in Dongdaemun that recently opened as a cafe-lifestyle shop is that it is very old -- more than 100 years old. 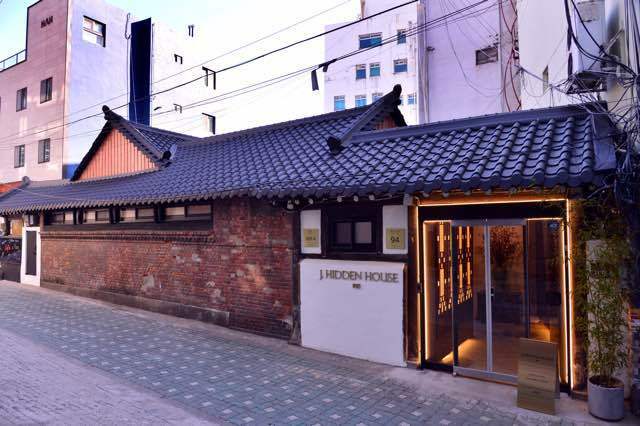 The J.Hidden House, situated on a backstreet in Dongdaemun -- the fashion hub of Seoul with the Zaha Hadid-designed Dongdaemun Design Plaza and all-night shopping malls -- is a pleasant surprise for passers-by. As she spoke, a light breeze blew, with the clear sound of wind chimes ringing throughout the peaceful property. The century-old house has been handed down in her family for five generations. Her great-grandmother raised her children in the house. Like many of that generation, she was the embodiment of living history, having lived through the Japanese occupation, Korean War and the rapid economic development -- and so is the hidden house. Given its architectural beauty, it was surprising to learn that the residence was used as a fabric storage facility in the late 20th century as the textile industry boomed in the area. “It is unbelievable. This beautiful house, more than 100 years old now, was used for a time as a fabric warehouse,” Jun said. In the spirit of sharing the beauty and tradition of hanok, J.Hidden House is available for corporate events and sponsors cultural gatherings. For instance, Young Yeol, a society dedicated to preserving Korean heritage, recently hosted a gathering at J.Hidden House. “As we look to explain and promote our proud Korean heritage to the world, I realized Seoul did not have an adequate traditional space to host such meetings. 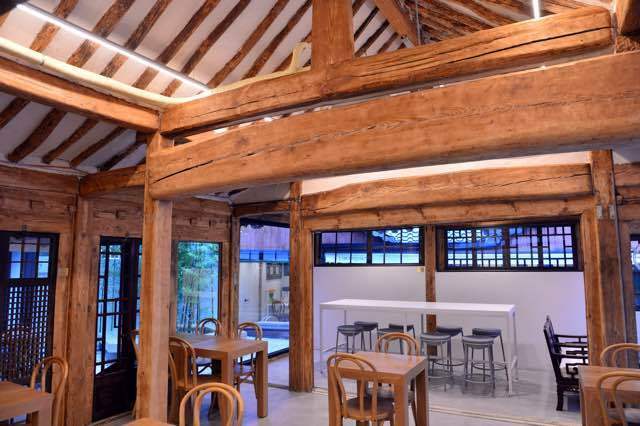 “To date, hanok structures open to the public have usually been small in size, creating the odd situation where even our proud and special cultural preservation meetings had to take place in modern steel-and-concrete buildings,” said Jun, a former public relations and advertising professional, now running her own show at the old family house after being a stay-at-home mother for five years. 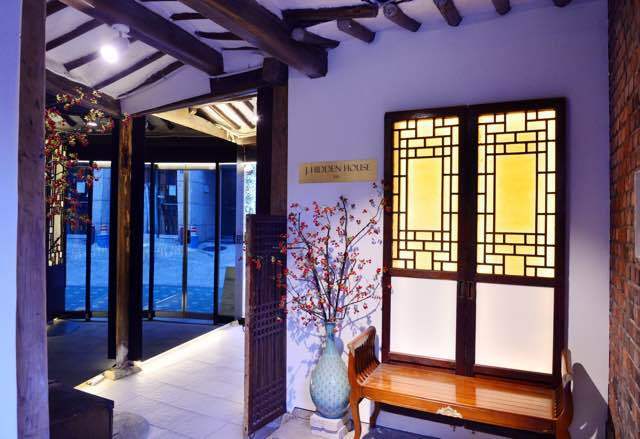 According to the Arumjigi Culture Keepers Foundation, Jun’s hanok, measuring approximately 300 square meters, is one of the largest existing hanok structures in central Seoul. To enhance the aesthetic value of the house, Jun incorporated elements of her academic background into the development. Having studied art history, she knows how to recognize and display the artistic value of objects. The doors and windows are century-old originals. 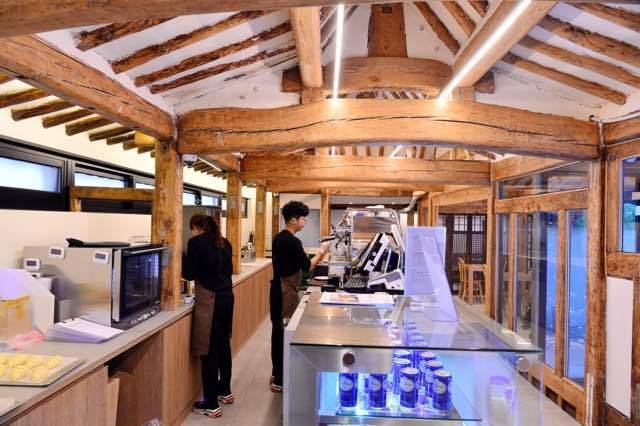 The original wooden hanok structure has been kept, with the surfaces of the massive wooden beams hand-polished to refresh them from decades of aging. The old wooden lattice windows have been preserved, safely protected with thick glass. Many of the original doors were removed when the house was used as a warehouse. Jun’s father preserved them, however, always taking them with him whenever the family moved. “Looking back now, it is like my father prepared all this. I thank him and my ancestors so much for preserving such a grand old house for me to share with others,” she said. Entire walls have been carved out, with floor-to-ceiling glass windows installed in their place to create an open and flowing atmosphere. Family heirlooms handed down through generations are displayed at the cafe. Time-worn skis hand-carved from wood are encased on a wall, grabbing the attention of visitors, along with bamboo sticks fashioned into ski poles.